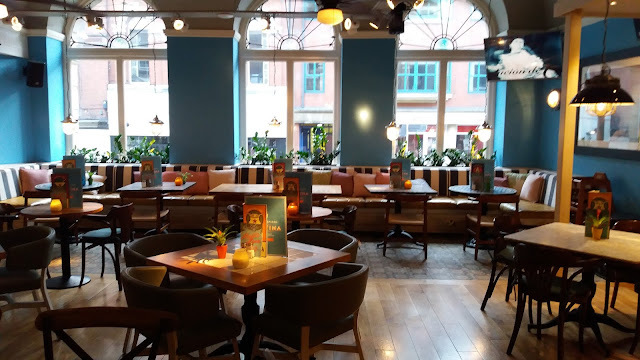 We've been wanting to try Revolucion de Cuba for a while after hearing lots of good things about it's fresh interior and adventurous Latin inspired menu making it one of Nottingham's current crop of places to be seen. Whether it's for a group party or cocktails on a night out, it seems that Revolucion de Cuba Nottingham is the place to be. Gone is the dingy feel of the old Long Island, replaced with a bright, airy and feelgood venue well worth a visit. It definitely feels more like somewhere you could sit and chat whilst listening to something Latin inspired. Coming towards the end of our Taste Nottingham Moving Feast experience we were here for dessert. After casting our eyes over the menu's it feels that Revolucion de Cuba could be a great place for Tapas. Having lost La Tasca from the city it could be that Revolucion takes over with our needs for holiday inspired flavours. With an evening menu available Monday to Thursday it's worth being aware that if you come at the weekend there will be more shaking than baking being done.